Wires are typically covered in a colored plastic coating to indicate which wire is which when it comes to live, neutral and grounding. Unfortunately, not all light fixtures come with the same wiring colors. This isn't an issue when you are first installing the light fixture, since you have a manual, but can be confusing to a future owner who does not. 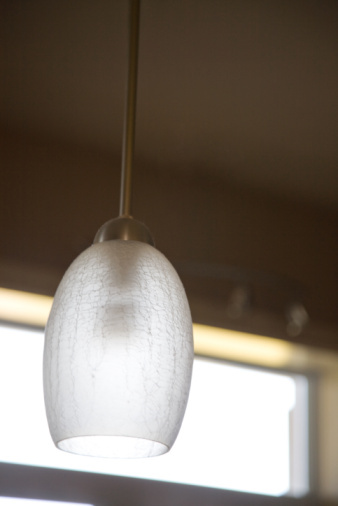 Lighting fixtures don't always have the same wiring color coding. Turn the power off to the room at the circuit breaker. Strip the tips of the wire coating off all the wires in the light fixture. Place wire strippers about 1/2 to 1 inch in and clamp down. Pull the wire strippers out from the wires to remove the coating. Connect the wires from the light fixture to the wires from the house. Look up in the wire housing on the ceiling or the wall and pull the wires out. Twist like wires together if there are any. Wires are often black for live, white for neutral and plain copper for ground. That being said, sometimes live wires are red and ground wires are coated in green. Also ground wires are occasionally coated in green and yellow-striped plastic. Twist wires together at the ends to connect them. Connect ground wires to a piece of metal inside the wire housing on the ceiling if there is no ground wire coming from the house. Wrap electrical tape around the connected ends of the wires and twist wire nuts onto the ends to secure them. Set the wire fixture up to the ceiling. Use the hardware that came with the fixture to screw the mounting cross bar into the holes of the wire housing in the ceiling. Tighten them with a screwdriver.